This field manager has the ultimate challenge in order to get new seed established during the busy season of the year. This field will experience high traffic through the fall even through the time it goes dormant. If you were that manager, what would you do? Compaction from high traffic is the biggest challenge with this native soil field. Especially through the center and on the sidelines of the American football surface. Overseeding during such heavy play seems nearly impossible. But an open mind and creativity can create possibility! Cultivation: Aeration should be the #1 cultivation focus for this field. Aeration should take place as often as manpower allows. If multiple games are being played each week, some sort of aeration can take place weekly through the high traffic field center. Yes… weekly! There can be fear of aeration of a grass field under high traffic. However we know the damage that compaction and surface hardness can cause. Especially on native soil. Avoiding the fear to be aggressive while using good judgment on how and when can counteract those compaction issues and increase use on a grass field. De-compaction: Deep tine or soil wave aeration is non-disruptive for de-compaction every other week during the playing season through the high traffic field center and sidelines. The entire field should be de-compacted every other time. Frequent de-compaction will keep the root zone open for deep rooting and will allow rainwater to move vertically through the soil profile to reduce the impact of rain events. De-compaction in combination with fall weather will allow the existing stand of grass to recover from summer stress and withstand heavy use as well. Surface aeration: Solid tine, rapid tine aeration or slicing is non-disruptive and can take place every other week, alternating de-compaction weeks, during the playing season through the high traffic field center and sidelines. The entire field should be done every other time. Surface aeration will soften the surface and create a seedbed for overseeding. Surface aeration will also open voids for topdressing sand to blend into the surface. 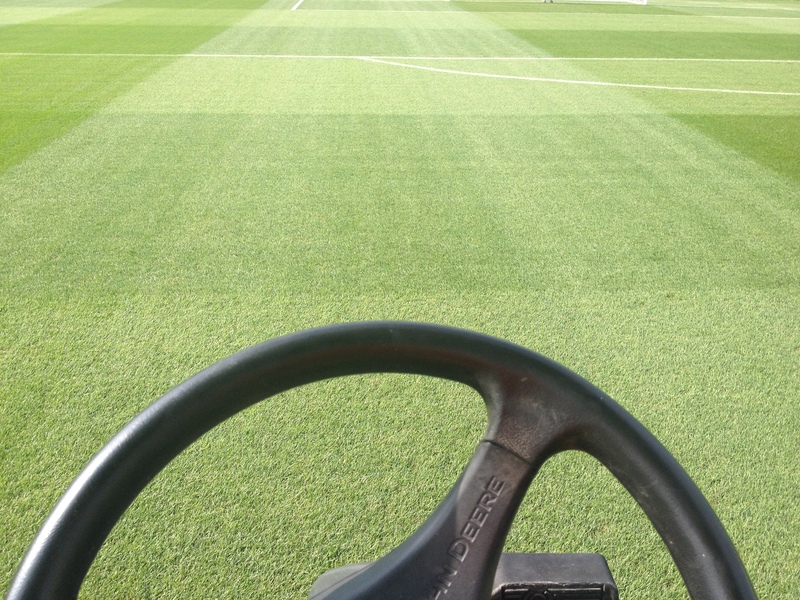 Seeding: Overseeding a field under constant using takes more creativity. Seed Selection: Using quick germinating seed with good traffic tolerance is important. In the past, perennial ryegrass has been an overseeding grass to avoid because of summer stress issues. But with genetic improvement for disease and traffic tolerance, overseeding with perennial ryegrass in season is possible. Aggressive new Kentucky bluegrass varieties are also available that germinate fast and sustain traffic. Combine perennial ryegrass with Kentucky bluegrass and seed the center of the high traffic field lightly (Up to 2 lb perennial ryegrass, 1 lb Kentucky bluegrass) each week of September prior to play. Seeding into October isn’t recommended unless in south Ohio as frost and cool temperatures limit seedling growth. Springtime seeding should utilize fescue with Kentucky bluegrass and limit the ryegrass use in the spring. Seed to Soil Contact: Seeding prior to the events of the week with allow the seed to get worked into the soil by cleats through the high traffic area of the field. In addition, the bi-weekly surface aeration will work in the seed. Aeration can be used as a seeding tool by seeding right behind surface aeration. The seed can fall down into the aeration holes allowing the crown of the seedling plant to be protected from traffic so it can re-generate after leaf damage. Light topdressing following the surface aeration and seeding will cover the seed to hold moisture for germination as well. This field manager may feel relief for the end of the season, but fall overseeding will be the catalyst for the field’s survival through a busy spring and summer. This field will be exposed to high traffic even before the grass breaks dormancy in the spring. If you were that manager, what would you do? Fall recovery and spring preparation are the goals for this high traffic field. Early season play likely aids the Poa Annua population in the field, so Poa control in the fall is important as well. Cultivation: Aggressive cultivation is important to promote recovery for the existing grass and create a good seedbed to encourage seed growth and establishment. Verticutting or Universe fraze mowing: Immediately following the season in preparation for overseeding, verticutting or Universe fraze mowing should take place. Verticutting is the standard practice for thatch and organic build up, removing 11%-15% of material. Universe fraze mowing can remove up to 100% of the thatch and organic build up, along with removing the Poa Annua plants and the Poa Annua seed. Re-generation from both practices makes the field more durable, with Universe fraze mowing producing a dramatic improvement in density and durability. Use either practice followed with the remaining cultivation practices. De-Compaction: De-compaction aeration should take place 1x immediately after verticutting or Universe fraze mowing in conjunction with overseeding. De-compaction will allow the existing grass to recover and open the sand profile to keep water moving through from regular irrigation for seed growth. De-compaction aeration can also take place as the grass goes dormant in late October to encourage natural aeration from freezing and thawing. Surface aeration: Surface aeration should take place following de-compaction in the fall overseeding process. Surface aeration with surface removal is important to encourage existing grass recovery. 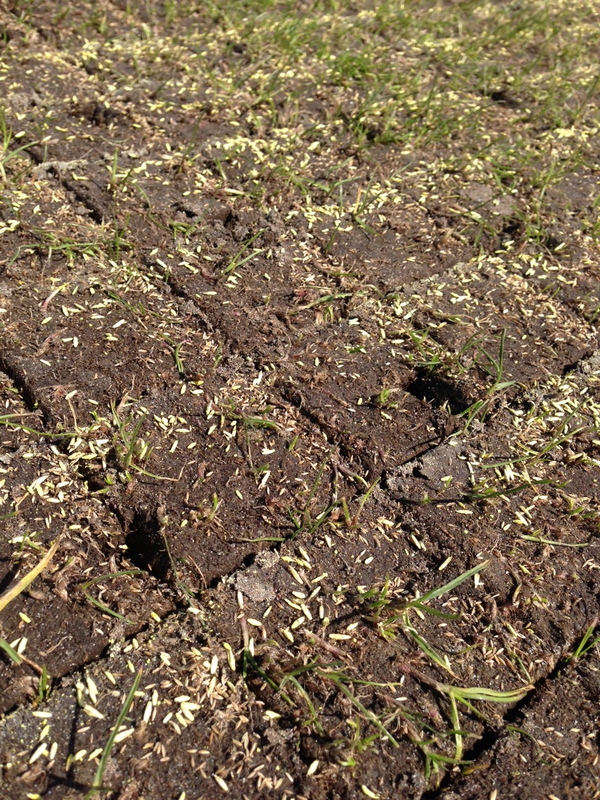 Core aeration or recycle dressing will open the surface and allow sand to be blended in. Seed immediately after surface aeration and use the open surface as a seedbed to establish seed. Topdress following seeding to cover and protect seed if possible. Seeding: Establishing seed during the fall with no traffic is a grass manager’s dream. But don’t be overly relaxed because establishment is essential for spring. Seed selection: Kentucky bluegrass can be the primary seed of choice in fall seeding with limited traffic. New varieties of Kentucky bluegrass are quick to germinate and establish. Depending on how early in the spring that play begins, keep in mind that perennial ryegrass is early to green up and grow in the spring. Fields with play in February and March can blend in perennial ryegrass with Kentucky bluegrass to provide an early season surface. 3-4 lbs of Kentucky bluegrass is an excellent overseeding rate. Do not use too much, as Kentucky bluegrass should be pushed to spread and fill-in. Add 2 lbs of perennial ryegrass to the early season fields as well. That rate of ryegrass will likely be taken over by the more aggressive Kentucky bluegrass in the summer. Seed to Soil Contact: Verticutting or Universe fraze mowing followed with core aeration or recycle dressing will create a seedbed for overseeding. A light topdressing can be combined to cover seed if desired. Did you approach these the same way? Share your experiences, both positive and negative, with your colleagues in the industry! THANK YOU for the feedback and participation. GREAT, GREAT feedback! Creative techniques for seeding in the fall to insure a durable field all year round. The fall season is the most ideal time for cool season field cultivation and overseeding. Consistent rainfall and cool night temperatures help existing cool season grasses recover quickly, while higher soil temperatures created from the summer heat make an ideal time to get quick germination and growth on seed. However, fall is also one of the most high traffic times of the year on many cool season fields. To avoid having to close fields completely, grass field managers are challenged to be creative and pro-active on fall field maintenance practices to meet the demands. Let’s re-examine some cultivation and overseeding approaches. Fall is a wonderful time for cool season turfgrass to recover from summer stress and grow roots for fall and winter play. But black layer from consistent watering, thatch from clipping and stressed or dying turfgrass, and compacted soils from limited cultivation during summer stress limit what existing grass and new seed can do. Before overseeding and fertilization are considered in a fall maintenance program, cultivation should be Step #1. De-compaction aeration is softening the soil down below a 6” depth. De-compaction allows for deeper rooting of existing turfgrass, allows better irrigation and rainfall infiltration, and softens the entire field surface for safety and playability. Timing: De-compaction aeration should take place a minimum of 3x during the fall season (or as much as budget allows). A deep tine or soil wave machine can be run the same day as a field event, so even if the field is under high traffic de-compaction aeration can take place. Soil air refreshing deep for de-compaction requires a 7- 10 day break and also can take place at the end of the fall season. Timing: The type of surface aeration used is to be dictated by the schedule of use. Core aeration could require a break of up to 7-10 days. On native soil, solid tine aeration and/or slicing can take place with play on the field immediately after. Sand could need a 3-5 day break in order for the surface to become stable again before play. Soil air refreshing down to a 4” depth requires a 5-7 break to grow in the slices. Verticutting is extremely effective in the fall, especially in conjunction with overseeding. Verticutting removes some thatch build up, opens up the black layer that can build during summer with heavy watering, and will promoted Kentucky bluegrass density and durability. Like core aeration, the clean up from verticutting can labor intensive. But just as core aeration, the benefit outweighs the challenge. Timing: Verticutting can take place w/ a 3-5 day break and in no effects stability or playability of a field. For practice, a field could be verticut the same day as play. The new cultivation technique of Universe fraze mowing has now proven to be a valuable practice. This is especially in the fall on Kentucky bluegrass in combination with overseeding. Similar to verticutting, Universe fraze mowing promotes Kentucky bluegrass density and durability while removing thatch and organic buildups. But instead of removing 11-15% of material like verticutting, Universe fraze mowing removes up to 100% of the material to the desired depth. That depth is set above the growing point of the Kentucky bluegrass to allow re-generation. Universe fraze mowing also removes poa annua plants that are short rooted from summer stress, the poa annua seed bank on top of the field, and other weed seed that has accumulated. 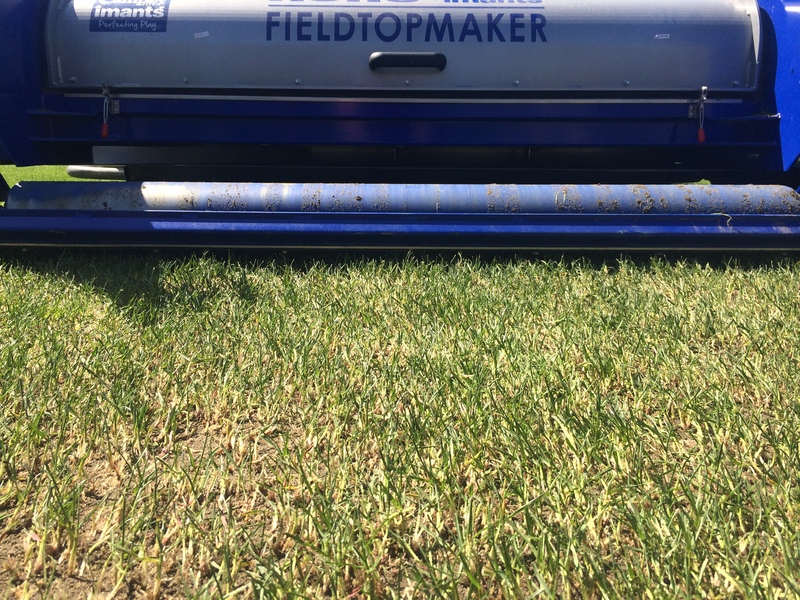 Universe fraze mowing also helps smooth the field surface. Timing: The depth or aggressiveness of Universe fraze mowing varies depending on the window of time the field as off. A light Universe fraze mow cleans the very top of a field and can take place in a window of 10-14 days. Going more aggressive to remove more organic and poa annua can require up to 21-35 days, depending on the age of the field and the amount of prior maintenance. New genetics in fescue, Kentucky bluegrass, and ryegrass are changing what is possible for fields and overseeding. Fast germination, increased aggressiveness for spreading and filling in, and stronger roots for establishment and quicker playability all exist. Also lowering demands for dark green color is being replaced with an appreciation for aggressiveness and durability unlike ever before. All lead to a new world for seeding. For an example, consult SportsTurf.com online and read the July article by Ms. Julie Adamski about a Kentucky bluegrass field that went from seed to play in 35 days. From Seeding to Play in 35 Days. That feat has provided an example and confidence for grass field managers exploring using new seed varieties. Additionally, the genetic improvements now make fescue and ryegrass capable of existing on high traffic fields together, in with Kentucky bluegrass, or even on their own. No longer do grass field managers have to hold their breath during disease stress times with these varieties. Do your homework on what is available from the seed companies you have existing relationships with, but consider possibly branching outside those relationships as well to find what is working for others. Keep in mind with seed; the old proverb “you get what you pay for” is 100% true. When seeding, no matter the variety you select, seed to soil contact is important. Soil contact ensures the seed is not sitting in the thatch layer or laying on top of the ground where is could dry out quickly or struggle to push roots down into the soil. There are a few different options for overseeding to will help promote seed to soil contact. Seeding in conjunction with cultivation: Seeding following core aeration, solid tine aeration, verticutting, or Universe fraze mowing can promote seed to soil contact. Aeration holes give the seed cavities to fall down into the soil. This is effective especially for fields still in play during seeding as the crown of the plant grows below the surface where it is protected from cleats. Do not aerate too deep though if doing so to promote seed. Verticutting cleans some thatch out and creates linear channels for seed. Universe fraze mowing cleans the thatch completely from the top, but it still needs an additional cultivation to work the seed into the soil. Keep in mind that when seeding in conjunction with cultivation, the more surface area that is opened up, the better success seeding will have. Using a penetrating seeder: Several different seed application machines are available on the market. With a seeder, just as when cultivating for seed, the more surface area that is penetrated the better off the seed application will be. Seeding before heavy traffic: Our forefathers in grass field management have handed down this method through years of use. Applying seed to the high traffic areas of a field 1-2 days before a heavy use will allow play to create the seed to soil contact. An example would be seeding the center of a football field prior to play. Keep in mind that if using any clean up techniques following the heavy traffic, it could also pick up the seed. Follow the high traffic event with a deep irrigation cycle to settle in the seed to ensure success with this technique. Topdressing to cover seed: Topdressing with sand, compost, or even lightly with the field’s native soil will create seed to soil contact. Keep in mind that too much topdressing burying the seed can be a bad thing . These are just a few ideas to help solve the complex challenge of fall cultivation and overseeding. Yes, there are many, many other ideas for meeting the challenge. Make sure to ask questions of your fellow grass field managers to create more possibilities to meet the challenge. Follow colleagues, STMA Chapters, and sports field managers around the world on social media to witness the creativity that others are using. Share your experiences equally for others to learn from your lessons to help build creativity and idea generation. This entry was posted in GGG Sharing Experiences, Maintaining a Strong, Healthy, and Durable Plant Under High Traffic, Positive Thinking, Turfgrass Growth by GrowingGreenGrass. Bookmark the permalink.